Comments: Deciduous tree species native to the interior desert areas of Asia. 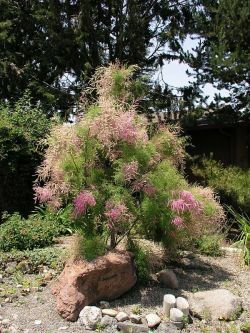 A low branching shrub or tree with multiple branches and racemes of small pink flowers. Leaves are very small scales on the branches and look similar to a cedar--an alternate name for this plant is the saltcedar. Adult specimens can be 20' tall. Though very attractive, this tree is considered an invasive species throughout the southern and western states.